He also added that the game was ‘distracting kids’ and ‘preventing them from studying’, which is what prompted the Himalayan nation to enforce a countrywide ban on it. 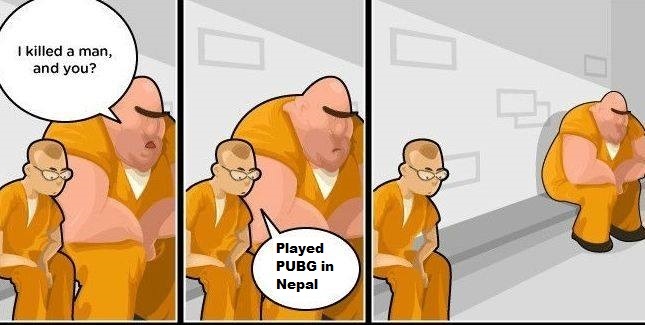 The Nepali government has ordered all mobile operators, ISPs and network providers to ban the game with immediate effect. There isn’t any mention of how any ‘offenders’ will be punished, but it is reasonable to assume that they’ll be let off with a fine and a warning. It’ll be a truly dystopian nightmare if someone goes to jail for it. But hey, we’re already in one so keep your fingers crossed. Old people have ranted and raved about video games ‘destroying their kids’ ever since video games existed. Technologically-challenged idiots have conflated gaming with just about everything ranging from violence to mental health issues, and that’s still ok. Everyone is entitled to voicing their opinions, no matter how crazy. The REAL problem is when people who are unwilling/incapable of raising their children want the state to do it for them. The primary reason kids get ‘addicted’ to games such as PUBG is because their parents have done a piss-poor job of raising them. So the next time you find Lil’ Billy glued to his phone, do something about it yourself instead of writing a strongly-worded letter to your senator. A state operates on limited resources and to even think of redirecting some of them to stop kids from playing video games is ridiculous. Not only is it in gross violation of human rights, but its also a massive waste of time and energy which is better invested literally anywhere. Sadly, countries such as India and Nepal have already set a precedent, and it’s only a matter of time before ‘concerned’ parents worldwide petition their governments to do the same. Talk about the road to hell being paved with good intentions.